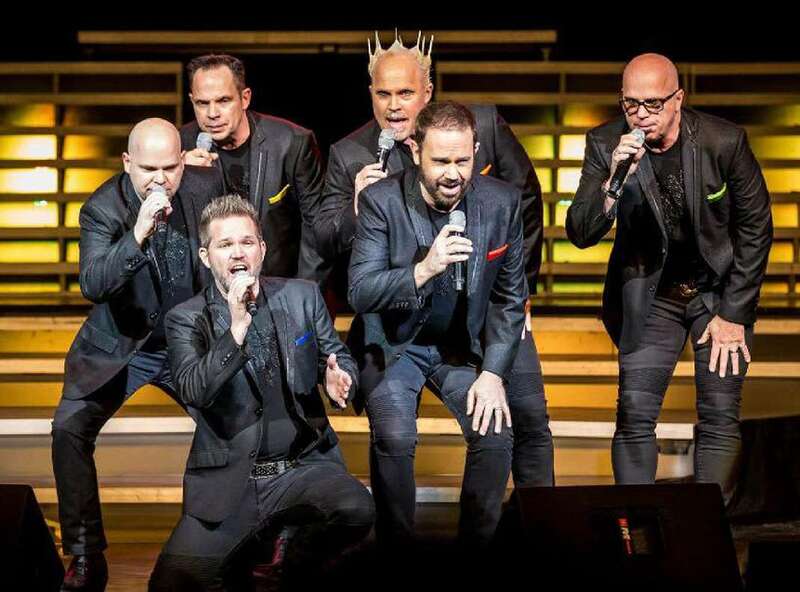 The “Six” at the Hughes Brothers Celebrity Theatre is one of high energy performance shows in Branson that brings on stage a group of six Knudsen Brothers. Thousands of Branson visitors every year give praises to this electrifying show in Branson making them enjoy a one-of-a-kind show experience. The amazing performances of these energetic brothers will captivate the hearts of the audience. Sensational harmonies, melodious instrumental sounds straight from their mouths, polished showmanship, and a healthy dose of mirth and merriment, the six talented brothers will entertain and charm you right from the start. The members of the SIX Show Barry, Kevin, Lynn, Jak, Owen, and Curtis had humble beginnings when they started with the popular Donny and Marie Show. This gifted group of entertainers set the standard of a show that goes far beyond singing a capella; percussion, strings, horns and other instruments, that can be heard harmoniously. With their stunning voices, perfectly honed from years of performing around the world and for A-list celebrities and top corporations, the Knudsen Brothers deliver one of the most in-demand shows in Branson. This group of six brothers brings it big-time with loads of music hits from some of the best, including Elvis, Kansas, Frankie Valli, MC Hammer, Coldplay, and Tom Jones. They’re not just talented singers, they also bring hilarious comedy; sharing family stories with a keen wit and superb timing, along with funny antics that include silly props and sound effects that come from their mouths. The six brothers dazzle with their colorful costumes, and wearing signature colors that carry over from the stage to the street; locals and visitors alike are delighted in seeing each of them stroll around town in a hot Camaro customized to reflect their stage color. There are many music imitators, but the “SIX” is just one sensational orchestra of electrifying human voices. This six singing group will captivate your heart as they perform the rhythmic percussion and booming bass that comes from musical instruments. Their amazing instrumental sounds accompanied by perfect melodies and incredible vocal range are sure to astound everyone in the audience. They have extreme playlist, you will never know what’s the next to play, it may be The Beach Boys, Elvis, or Tom Jones or any of your favorite 60’s artists. On top of their sensational performance, they’ll entertain you with their hilarious comedy and great family stories that only brothers can share. The popular Hughes Brothers Celebrity Theater in Branson is also home to a number of popular shows in Branson where many visitors consider it a great place to see live entertainment show. Other entertaining shows performed in the theater include The Hughes Brothers and Goldwing Express that will keep some of the audience come back for more. The seven years stint of the Knudsen Brothers in Branson continued to captivate audiences with their great music. So, if you want to see the fabulous performance with SIX Show in Branson, come visit the Hughes Brothers Celebrity Theater and be amazed with this unique show.